1922 Mr. Pappas from Lewiston, Maine. RPPC. 1922 (digitally erased date at bottom). Private Collection. Roaring Twenties gentleman. On this photo I like the trousers’ pocket flap peeking from below the waistcoat. This gentleman is rocking his suit and hat, isn’t he? I like the classic 20’s look very much…but if you’re a regular reader of my blog you already knew that. And the man was a shoe craftsman. A coincidence after the cut. The pose is great, of course! This photo I acquired from the family album of Greek immigrant Charles (Chas) Pappas, a mandolin/banjo teacher based in Lewiston, Maine. And this is where it gets interesting from a collector’s point of view. The first shoe craftsman (called a shoe hand back then) I added to my collection is Frank Newell Libby on a tintype taken in the 1890’s. 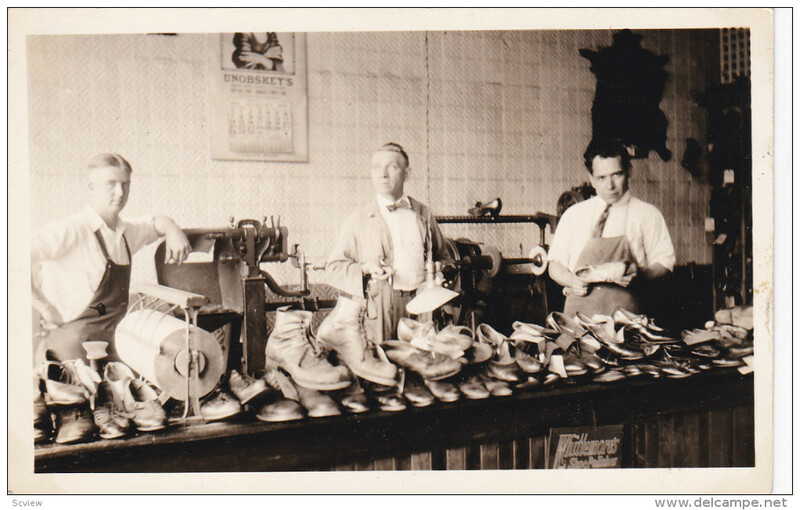 After seeing the photo of this gentleman at a shoe shop I realized both were from the same area: Auburn-Lewiston in Maine. Frank’s two sons -Harold Blake and Howard Stanley- were also shoe hands and would have been around Mr. Pappas’ age; one about forty and the other in his twenties. If Frank Libby and his sons knew Mr. Pappas through their common craft this would be a nice coincidence, and really not a crazy stretch of the imagination due to their close shared location (literally 5 miles or under). Also, at first I wasn’t sure if this man was a Pappas. He could have been a family friend but unfortunately I believe his identity was validated when I found one of his descendants, a young man of the same last name and from the same area who tragically passed recently and looks *uncannily* like him. This entry was posted on Saturday, May 9th, 2015 at 2:40 pm	and tagged with 1920s, Charles Pappas, Chas Pappas, classic, fashion, gatsby cap, jaunty cap, Lewiston, Maine, old photograph, postcard, prohibition era, retro and posted in Gentlemen, RPPCs. You can follow any responses to this entry through the RSS 2.0 feed.